A project set up on Salisbury Plain to reintroduce the Great Bustard has hailed the successful hatching of three wild chicks as a "huge step". 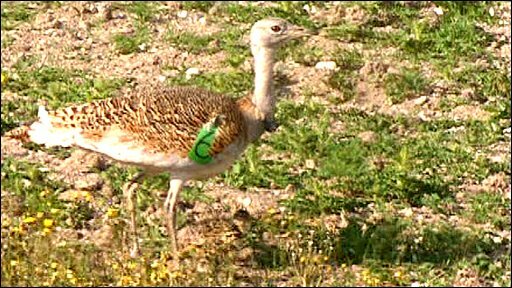 The chicks mark the first successful breeding attempts by the Great Bustard Group which has been working to bring the species back to the UK since 1998. David Waters, the man behind the reintroduction of the birds, described the news as "absolutely brilliant". Great Bustards became extinct in the UK in the 19th Century. Mr Waters, a former policeman who founded the Great Bustard Group, has dedicated his time to bringing back the "spectacular" bird to one of its former strongholds. "The bird was reasonably abundant at one time from Yorkshire down to the South West," he said. "One of its strongholds was Salisbury Plain, which lends itself to reintroduction, because it's a big military area which has changed very little since the Great Bustard was here, and has never had modern agriculture." The bird is iconic for the area and is found on the Wiltshire coat of arms. The species suffered a huge decline in numbers in the 17th and 18th Centuries as a result of changing farming practices and hunting, and has only been an occasional visitor to this country since the 1840s. It has also seen populations fall worldwide and globally is considered vulnerable to extinction. Dr Mark Avery, conservation director of the RSPB which is supporting the project, said: "The hatching of Great Bustard chicks is fantastic news for conservation and marks yet another chapter in the drive to bring back lost species to the UK." Under the reintroduction scheme, about 80 Great Bustards have been released on a Ministry of Defence-owned site on the plain since 2004. Eggs are taken from nests on farmland in Russia before being hand-reared without close contact with humans. They are then brought to the UK, where they are put into a large enclosure until they are ready to fly away of their own accord. "What has to happen now is these chicks have to grow up and breed themselves, but this is a huge step for the project," Mr Waters said. "I defy anyone to go to the Galapagos or anywhere in the world and see a bird more spectacular than the Great Bustard," he said.